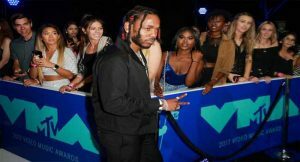 The MTV Video Music Awards on Sunday gave its top prize to rapper Kendrick Lamar in a televised party that drew some of the music world’s top names. With political tensions high in the United States and mega-storm Harvey bearing down on Texas, the glitzy annual gala was more somber than usual, with fewer of the show’s signature incidents designed for shock value. 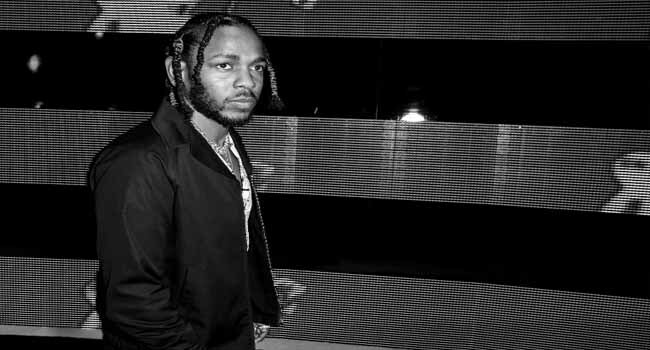 Kendrick Lamar literally dominated the awards, closing by winning the coveted Video of the Year and opening with a fiery performance inspired by martial arts. Lamar put on a medley with his nominated song “HUMBLE.,” initially staying hidden between the laser rays before he was chased on stage by ninjas. One ninja stunned the crowd by appearing to set himself ablaze while still twirling around, before the back of the stage turned into a fence of fire. Heyer was killed when a white supremacist supporter plowed his car into counter-demonstrators against a rally involving neo-Nazis in the Virginia city. Bro, keeping control of her emotions as the crowd applauded, announced that she was setting up a foundation in her daughter’s name to offer scholarships for people pursuing careers in social justice. In another social message, the rapper Logic brought the crowd to its feet with the song “1-800-273-8255” — the number of the US suicide prevention hotline. 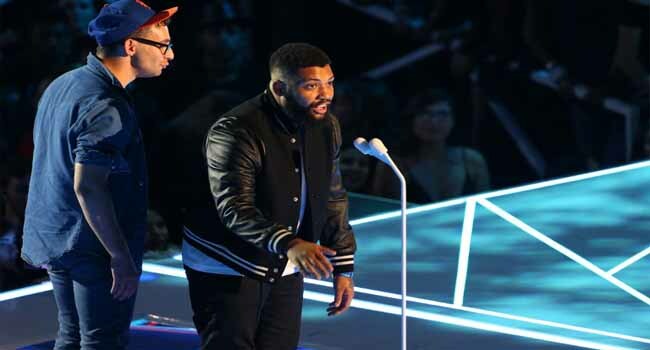 Accompanied by two rising stars, pop singer Alessia Cara and rapper Khalid, Logic was joined on stage by dozens of people who had attempted suicide and wore the hotline number on their shirts. Pop superstar Katy Perry, serving as host of the VMAs, took the stage by floating from the sky in a spacesuit — the emblem of the awards — before incessant wardrobe changes. While Perry has bared a new sultry side on her latest album, her jokes showed more innocent humor. She called up astronaut Buzz Aldrin, the second person to walk the moon, and asked if he created “the moonwalk” — the signature dance of Michael Jackson. Perry also brought a baby doll — teasing DJ Khaled, whose infant son appears in a video — and ended the show back in the sky, this time to slam-dunk basketballs. Pop singer P!NK was presented the Video Vanguard Award for lifetime achievement and marked the occasion with a performance atop a car that looked like it would fly into the audience. Accepting the prize from television host Ellen DeGeneres, P!NK recalled that her six-year-old daughter — watching from the audience — had complained of not conforming to girls’ ideas of beauty. P!NK said she replied by giving her daughter a PowerPoint demonstration to teach her to welcome androgyny, pointing to the long list of successful gender-bending artists. 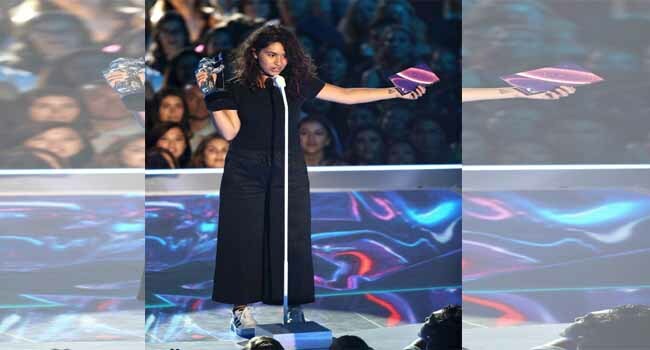 Lorde, the young New Zealand singer with a knack for the quirky, came down with the flu ahead of the VMAs but went ahead with a performance. Expressing herself with her body rather than voice, Lorde contorted her body before offering big smiles and throwing herself to the ground. One musician who draw attention on social media did so inadvertently. Jack Antonoff, the producer who also performs in bands fun. and Bleachers, was caught on camera intently eating a banana, undistracted by Katy Perry.